Anyway, I digress… We had the privilege of competing in the 41st Moore 24 Nationals August 25th thru the 27th and what a Nationals it was! 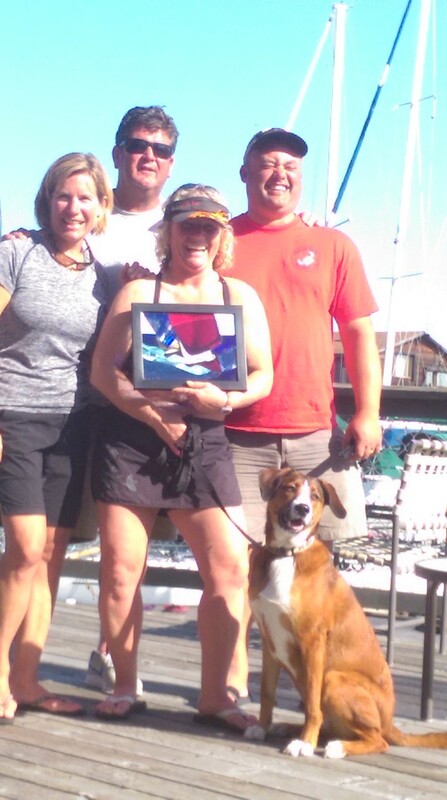 Hosted by one of our favorite California yacht clubs, Richmond Yacht Club, it was certainly one for the record books. Arguably not one of the best attended Nationals in history with 16 boats but certainly memorable and super challenging for everyone that made it out. The forecasts lined up favorably for us Pacific Northwest Sailors. 17 to 19 knots on Friday, 9ish knots for Saturday and 6 to 7 for Sunday. Nothing crazy and winds that lend themselves towards sailors with more time on their genoa’s than that little non-overlappy thing up forward. – Or So We Thought…. Friday was amazing, we sailed out for our very respectable noon starting time and had two amazing buoy races in the slot. Affectionate name right? The slot, that area of the Berkley circle that lines up downwind of the slot between Alcatraz and Angel Island. Basically the windy part of the circle. 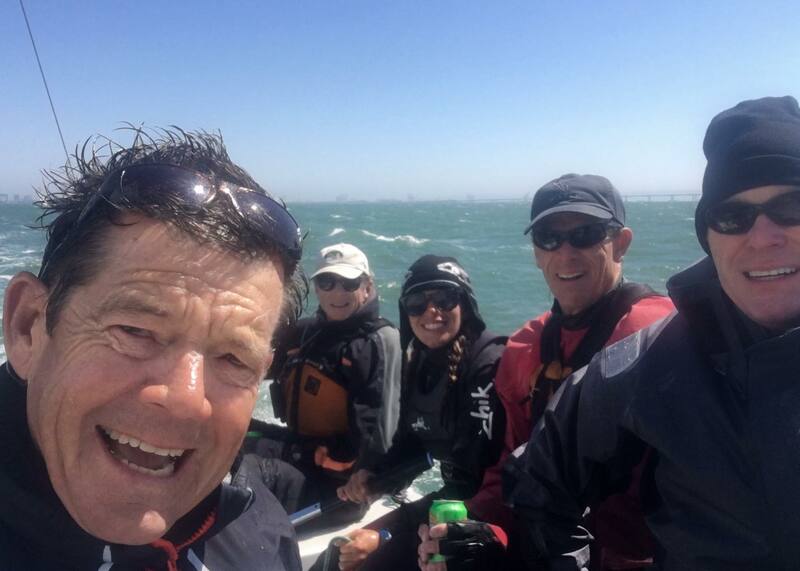 We learned later that these two races were the only time the forecast was correct, yes we sailed in about 20 knots of wind and wouldn’t you know it the immortals aboard car #68 Gruntled whooped everyones butts taking their first two bullets of the weekend. What an interesting course they had. The top mark was set to the right side of the course which of course encouraged a port tack approach and then the current and choppy waves would push you down away from the mark if you made any attempt to approach from starboard. So here we are in the second race approaching the mark on port at the circle looking for a lane to tack into so we can round the mark cleanly. We start to hear some yelling, assume it’s the normal “Hey don’t tack there, NO ROOM” type yelling and then I begin to duck a starboard boat to then spin up and tack over to round the mark. Except this boat is heading down at me and I struggle to release everything to not hit him and get around his transom before dropping the helm to spin up close hauled and find myself pointing at the transom of one of those 50’ charter day fishing boats with a full pole over the side load of passengers drifting through the circle right at our top mark. These guys were hooting and hollering, probably getting the best sailing show of their lives but man that was a cluster F.
Next up was our distance race, the one non-buoy race planned for the weekend. Thankfully the wind in the slot began to build a little more as they sent us off the line to Blackaller buoy up near the south tower. Through various lines the fleet worked their way up the old dilapidated remains of the Berkeley pier, around Treasure Island to the city front where we were treated to one of the most spectacular treats of sailing in the Bay area – short tacking the city front. Now us Pacific Northwesterner’s are used to short tacking but the novelty of having it be a busy working city front and not some desolate Eagle clamming beach wasn’t lost on us – it was spectacular. Up past the St. Francis Yacht Club basin and into the fluky winds around the Blackaller buoy we pleasantly found ourselves sailing up front with the immortals, probably set up to round 4th if we played our shifty wind tactics right, that is until we noticed a Moore 24 looking like they were out for a nice daysail from Sausalito reaching across the opening at the gate – Crap! Thats god damed Sorenson, he sailed up Angel Island and is going to beat most of us to the top mark! We learned later that #92 even recovered from a crew overboard situation on the other side and still rounded at the top of the fleet. Well done Fire and Fury Like the World Has Never Seen as the little old #92 is affectionately named this regatta…. Just after the rounding, just as we were getting to that point the gusts are getting strong enough to pull us up on a plane here comes another one of those darned fishing boats. We have one Moore about 5 boat lengths in front of us picking up on a plane and this fishing boat is approaching us from port, just to windward in front of us and closing quickly. I give him the palms up shrug, what are you going to do here to which he responded by turning harder to starboard and hitting the narrow gap between us and the other Moore – good thing a puff didn’t catch us right then! These fishing guys are certainly bold down here. The run back to the “slot” in the Berkeley circle was nothing short of Epic. The fleet went every which way imaginable. Some running back and forth across the bay for the simple pleasure of going as fast as they could in the now 25+ knot breeze. Reaching off towards the west tip of Angel Island was the quick Gruntled along with the quick sailors on #36 Mooregasm heading all the way in to beach and having to reach out so hard they managed a few squirrelly round ups to get up around the point Blunt marker. 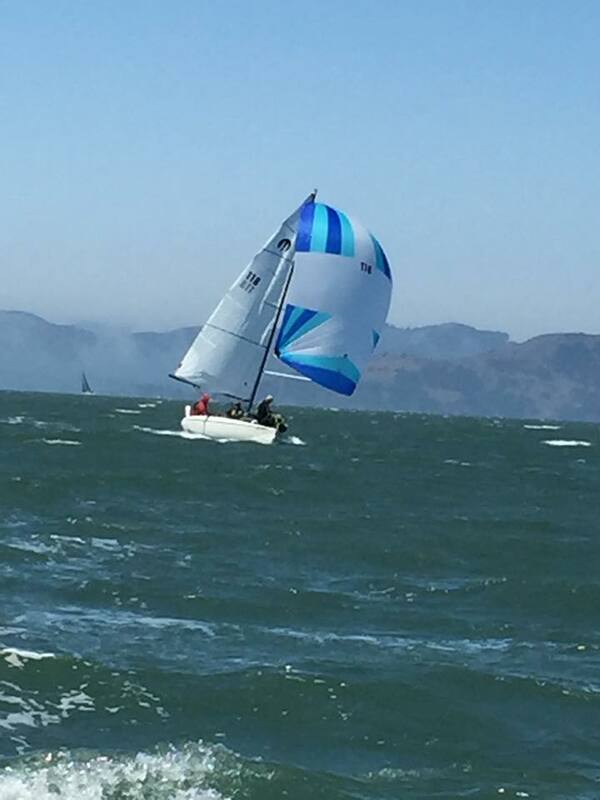 #118 Banditos and #92 with the flashy name ran down the other side the bay towards Alcatraz and #78 Great White Trash ran down the middle left with us, More Uff Da hot on their tail. Getting the puffs first and slowly reeling them in, that annoying boat behind you that is inching closer all the way downwind, that was us, zooming down the bay in one of the most epic runs down the bay I have ever done. When we started the distance race we had a good idea of where Blackaller buoy was, but had no idea where the B.O.C. (Bottom of Circle) mark was nor what it should look like. “We’ll worry about that when we’re leading the fleet” I said to everyone. So here we are now in second place behind #78 and have no idea where we should be going. To make matters worse the locals on #68 were still reaching back and forth behind us, I’m sure having a rip roarin’ time but one minute they are heading towards the Berkeley pier and the next time we turn around they’re rippin’ off towards Richmond – Not Helping! I’m sure you see this coming – but we had no idea at the time that the crew on #78 had no idea where the B.O.C. mark was either so here we are two blissfully unaware boats leading the fleet to a mark we have no idea where it’s located nor what it looks like. Both boats sent our office person below to read the course description again and thankfully for us the crew on #78 read the fine print at the bottom stating the B.O.C. mark was actually the leeward tetrahedron we had been using on the buoy racing. Two of the quickest full plane take downs happened on these two clueless boats I’ve seen and somehow they got it done and around the mark to the finish. Too funny and exactly the shenanigans we all like to see and experience on a distance race. The reach back to Richmond was amazing and finished with a nice drift into the yacht club basin followed by the standard keg on the dock and dinner at the yacht club. Great times with valued friends from up and down the west coast. Saturday dawned light, as was forecast and we left the dock early for the long, and I mean long, sail back out to the far side of the Berkeley circle. Friday we had it easy out there, just a 7 boat J/111 fleet sharing the bay with us, but Saturday was a different story – 60+ opti’s to the right of us, 5 J/24’s racing below us and the J/111’s somewhere off in the distance – sure hope we get those fishing boats again! Once racing finally began it was top of the #1 conditions to the first mark – still set to the right of center for that fun port tack approach and downwind it continued to build. We tried the #2 to weather but by the end of beat two we were way overpowered and switched off to the #3. So much for that PNW advantage on the Genoa eh? Windy all day, windier than Friday and wow so many great downwind zooms that I can’t begin to describe them all. Gruntled took their last 2 bullets of the weekend in the first and last race of the day with #36 jumping ahead on race 2 Saturday to dominate the fleet – a great feeling to take a look at the bow of the immortals on Gruntled. 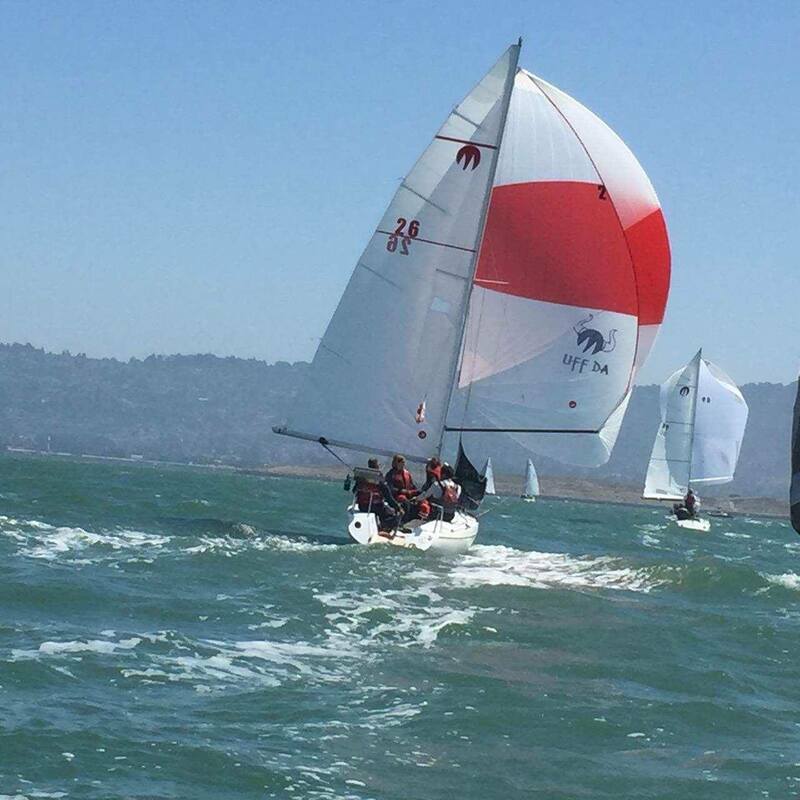 We had managed a 7,7,2 Friday and improved on Saturday with a 3,3,5 which had us tied for 5th after doing some of the best sailing we have ever done down here in California on More Uff Da. New mast, new Ballard Sails and a driver and trimmer that very stubbornly began to change how we wanted the sails to look towards what, as it turns out, is much faster than our ideas – big improvement for our program. Keg and taco truck in the parking lot followed by late night shenanigans at Ron’s house – another epic day in Richmond. Sunday we found ourselves getting towed out to the course like the opti’s, the winds were so light, just as they were forecast to be, but by race time we were into the #2’s and by the top mark, you guessed it, #3’s again! This light air sailing in the bay is brutal, what the heck is a windy day like? So here we are, 16 fun old boats pounding and zooming around in 25 knots of breeze on the bay, we are all sore and worn out middle aged sailors and wow, what an incredible time it was! Yes the top mark was set right again, maybe a bit more right causing more than one small collision as port boats came out of nowhere at the top mark. But fortunately for everyone it was set closer to the starting area so there was less separation before the rounding. But in true Moore fashion we crowded around the mark, set our poles while heading towards the offset mark and pop that chute up damnit! I don’t care if that boat 3’ in front of us is wiping out, hoist, hoist, hoist! Man that was crazy, some of the most active driving I’ve done in awhile and after pulling a beautiful half gainer through the squirrely fleet we ended up planing off away from the melee and back into the race! Those are the moments you remember. The second race was amazing for More Uff Da we started strong, hit the waves right, extended out and nailed the perfect port approach line and looked around – “I think we’re going to round first!” We zoomed off to leeward with #118 hot on our tail – is that Gruntled behind us? Yeah baby, yeah. #118 got by us on the next weather leg, edging us out with their superior driving in the chop and downwind we did our best but couldn’t fully real them in until the last jibe when they succeeding in doing the most epic round down no boom flying across recovery I had ever seen. Got us the inside overlap at the leeward mark but wow, that was amazing Banditos. We rounded inside, had the upper lane leading to the finish and wouldn’t you know it #26 got her first bullet in the California fleet since we purchased her in 2005! She was going fast, the sails were amazing, the crew work was near flawless, the BBQ was thankfully still on the transom, our lunch flag was flying crisply in the strong breeze and the music box was playing our favorite tunes – life doesn’t get much better than that. I’m sure we probably laid a little too much of our old selves into that second race Sunday but race 9, the last race of the weekend in this not so light air Nationals regatta was a challenging 5th place finish setting us up for our best overall finish in our California regatta racing history. Now I’m certainly not in the immortal sailor category like Bart, Hodges, Rowan, Morgan, etc.. but it sure felt good to be up top of the mortal category and get a taste of what it’s like to throw a good couple tacks on the leaders and learn their bows don’t look any different than mine (even though their transom’s do…). 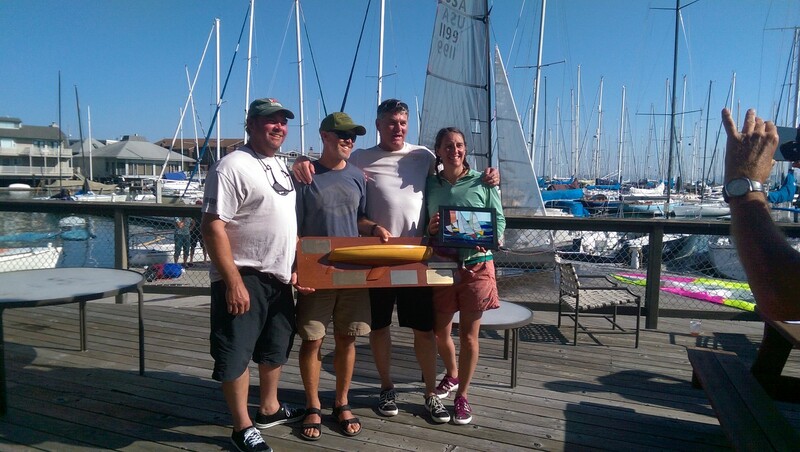 #68 Gruntled took first with some very consistent top notch sailing and four first place finishes ending up with just 13 points after throwout. 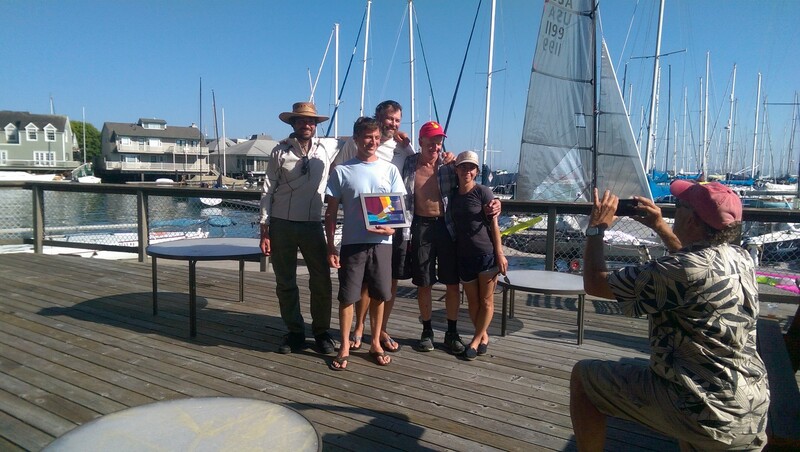 The first place trophy could not have gone to a better group of sailors, both on and off the race course. #78 Great White Trash sailing with a good group of immortals took 2nd and two first place finishes ending up with 26 points after throwout. #26 More Uff Da (UFF DA!) took 3rd and one first place finish ending up with 31 points after throwout. #36 Mooregasm took 4th and two first place finishes, including the last of the regatta, ending up with 33 points after throwout. #92 Fire and Fury Like the World Has Never Seen back in town after their exclusive three year tour of Europe, Scandinavia and the sub continent pulled off a 5th place finish ending up with 51 points after throwout with 6th place just one point behind them. What do you think Scott – Murph and Magic Tones for the next regatta? Truly amazing regatta with all the requisite jackassery and shenanigans on and off the race course. I can’t think of a boat I have had more fun on nor a fleet I’ve had more fun with both on and off the race course. Our Moore family is big, growing and changing as the years go by but as long as these spoil the bonfire boats keep pounding along this kind of recreational sailing will never die. Thank you George & Ron, you made a hell of a good to time for all of us. Butler and Verutti, if it wasn’t for you too many of us wouldn’t be sailing in this fleet today – your legacy lives on. To the fleet, don’t go changin’ – we’ve got a full tank of gas, half a pack of cigarettes, it’s dark and we’re wearing sunglasses. Hit it! The best regatta recap I’ve ever read – thanks! Thank you! That is very kind of you to say.